We bought our PC-2350 new in June 2007. Here are things bought & changes made for it to serve us a little better. As ideas come to mind and are implemented, I add them to this old post. We have the cherry finish option. I found close matching pre-finished shelving at Home Depot. 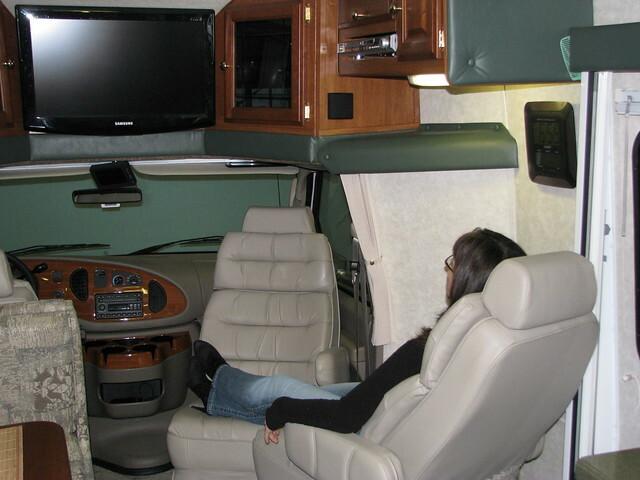 The top shelf holds our RV documentation, from manuals to vehicle registration and insurance. The vertical slots are used for park literature and all the rest. 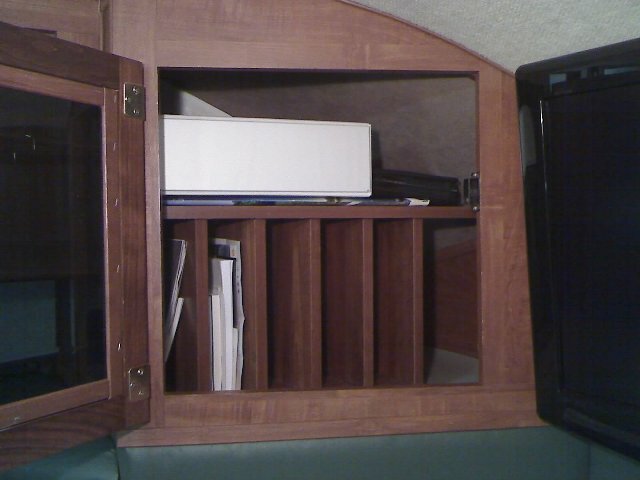 In the right cabinet, I added a shelf to store our laptop computer. 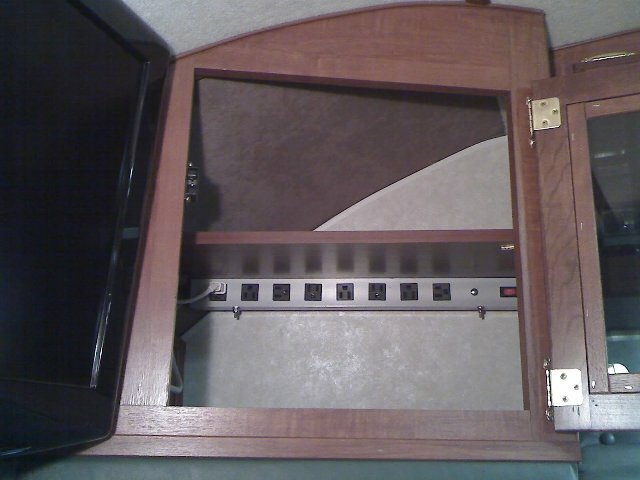 I also added a power strip underneath it with outlets at various orientations to accommodate all our different charging power supplies. The laptop, cameras, cell phones, video camera, & two-way radios, all plug in at the same time. 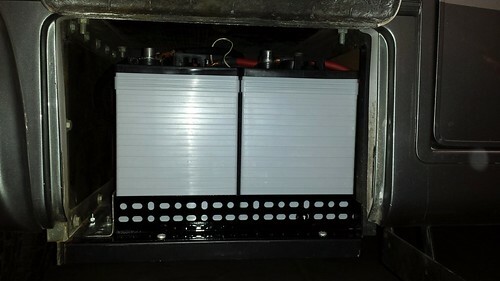 All chargers are ready to go at the flip of a switch when we are driving, plugged in, or when the generator is running. Improves the performance of the fresh water pump. 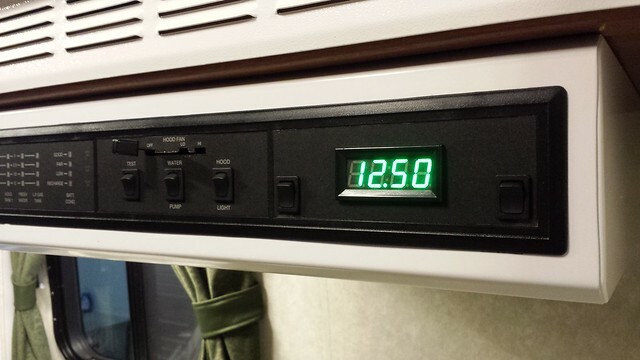 Water pressure and temperature is more consistent when dry camping. 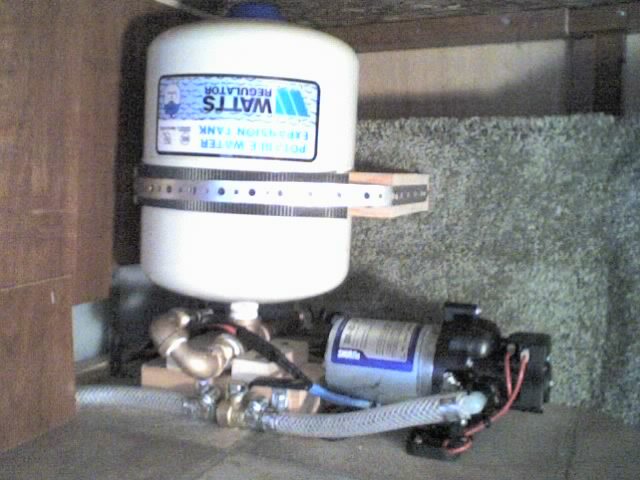 The pump runs very quietly and cycles on and off at nice comfortable intervals. 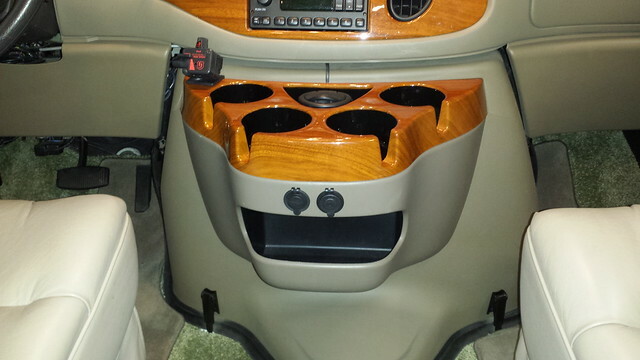 No more quick on/off loud groaning and vibrations. Simply stated..."Now It Just Feels Right". Write-up with pictures available. Provide your email address. Given it's location in the outdoor storage compartment, I made an enclosure to protect everything. It mounts under an overhanging cabinet at the foot of our bed, utilized as a shelf. We use it all the time. This limits the swing of the entry door. 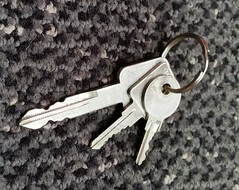 On a strong windy day, the door can easily rip out of your hand, swing around, and crash into the side of the RV. 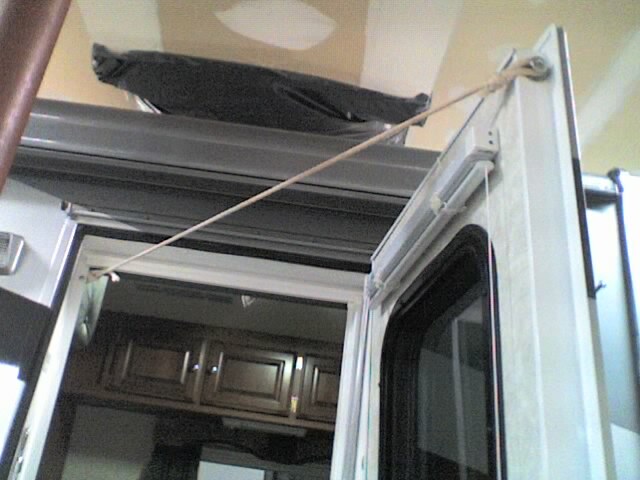 When our awning poles are attached to the side of the RV, this prevents the door from hitting the pole there. The limiter is engaged and disengaged in seconds with the door open or closed. It is not visible when not needed, and is self storing. 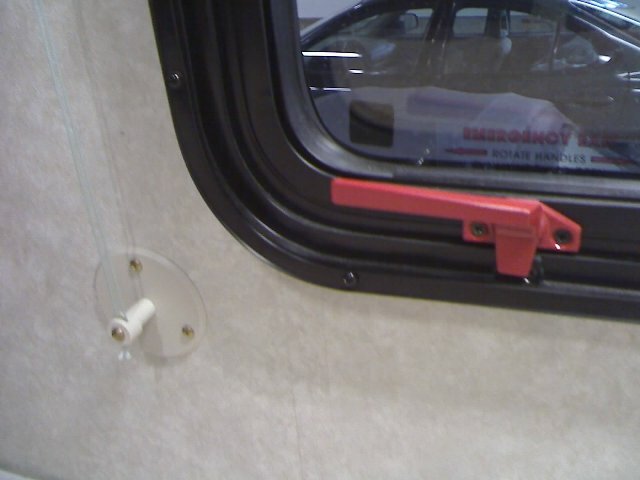 It also never gets in the way when entering or exiting the RV. The rope stretches a little so it offers a nice "Soft Stop" action. 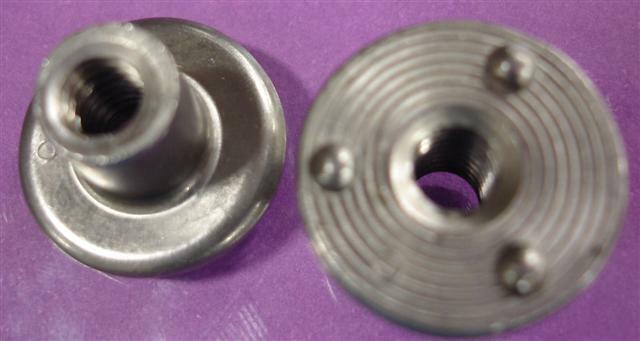 Flange weld nuts are perfect to hook the rope on. Flanged Weld Nuts work great for hooking the rope on and off from. 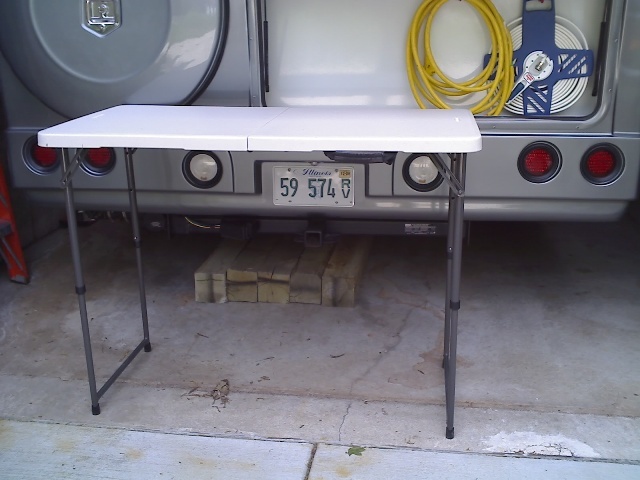 I reinforced the shade tensioners that hold the shade strings at the bottom. 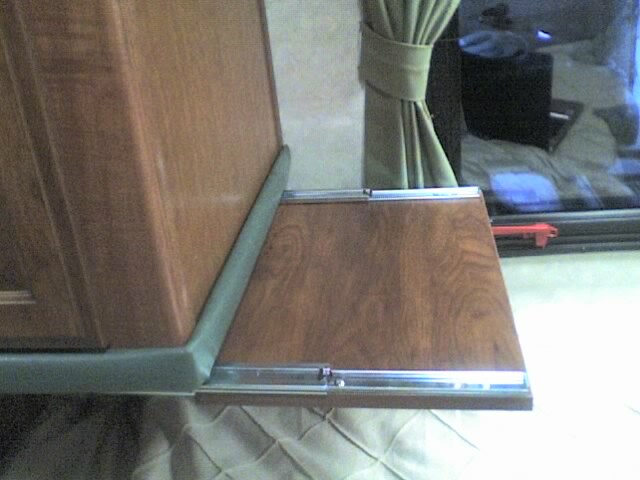 No more issues with those things pulling out of the wall when bumped hard, and bumping them is very easy by the dinette and bed. The solution looks nice too. Write-up, pictures & drill template available. Provide your email address. 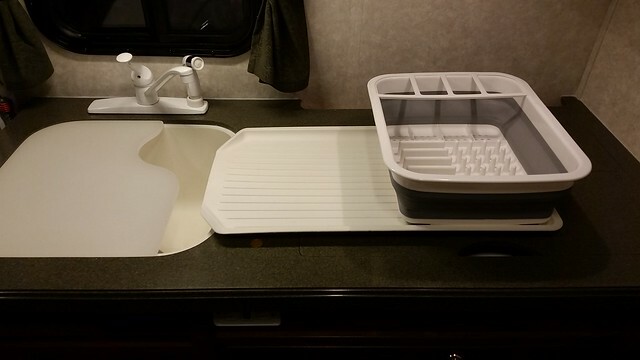 Wow, what a difference this made with rattles in the RV. We bought solid foam rubber drawer liner material on a roll from a home improvement center. 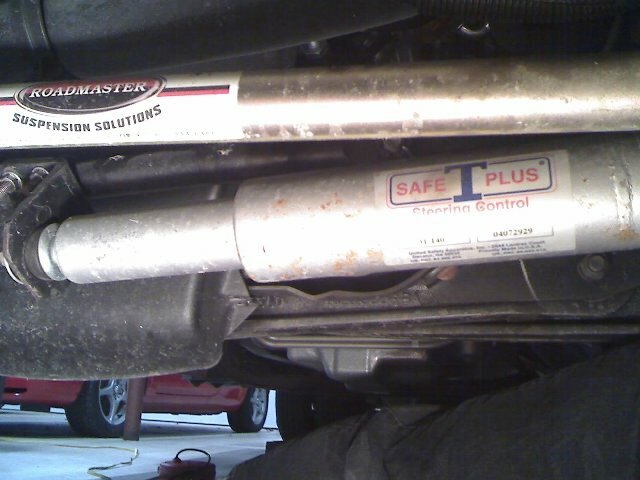 Everything stays put better, and rattles much less. Cost: $7 per roll. A few rolls were needed. 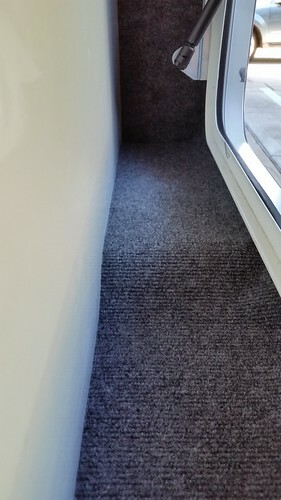 A little carpet tape keeps them in place. 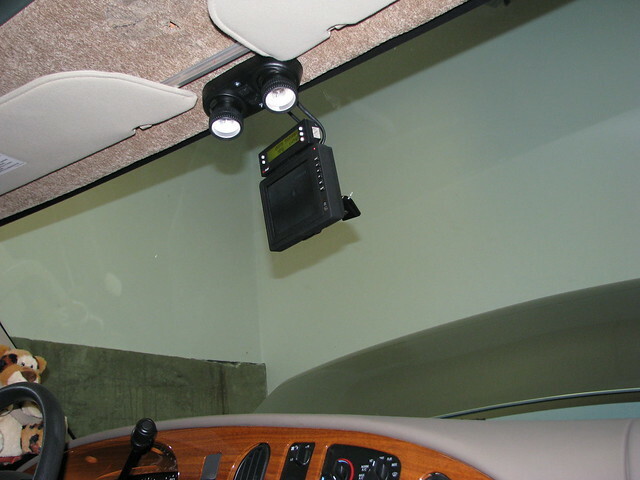 Hang the clock on the wall, and place the transmitter in the rear compartment in it's holster. The clock displays a lot of information including indoor & outdoor temperatures, and indoor relative humidity. It is also an alarm clock. I mounted it to the left of the entry door so it forces us to get out of bed to turn it off. It's great to know the outside temperature. With a Unified Tow Brake, our Liberty is very easy and safe to tow. 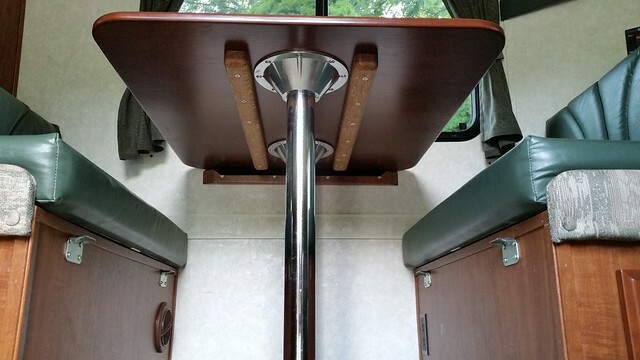 Having all this work done by a truck suspension shop was a costly $3900, but I cannot emphasis enough, how this has improved the handling, comfort, and safety of the motor home by leaps and bounds. 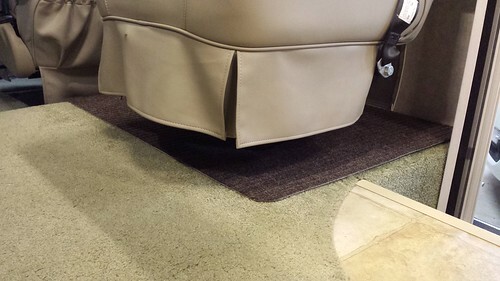 Our PC-2350 now handles like an SUV...not an RV. No more wandering, boat rocking, swaying, or wrestling when trucks go by or with cross-winds or on uneven road surfaces.....you know....those highways with the groves from heavy truck traffic. My wife can sit at the dinette, and her coffee will stay put on the table. 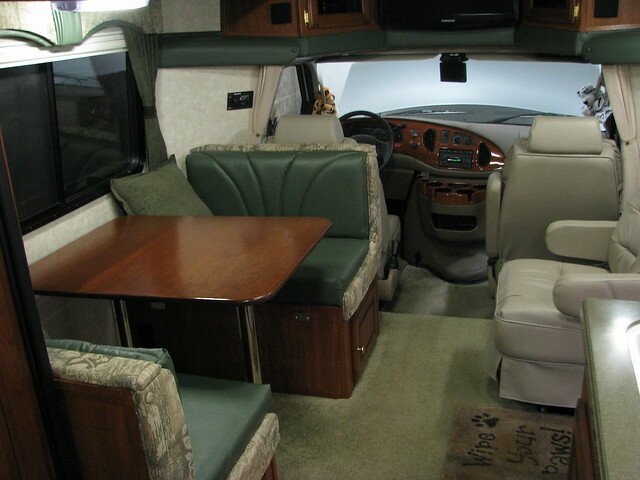 You can also nap in the rear bed without getting tossed around. Mountian roads are taken with the greatest of confidence, even when towing the Jeep Liberty. 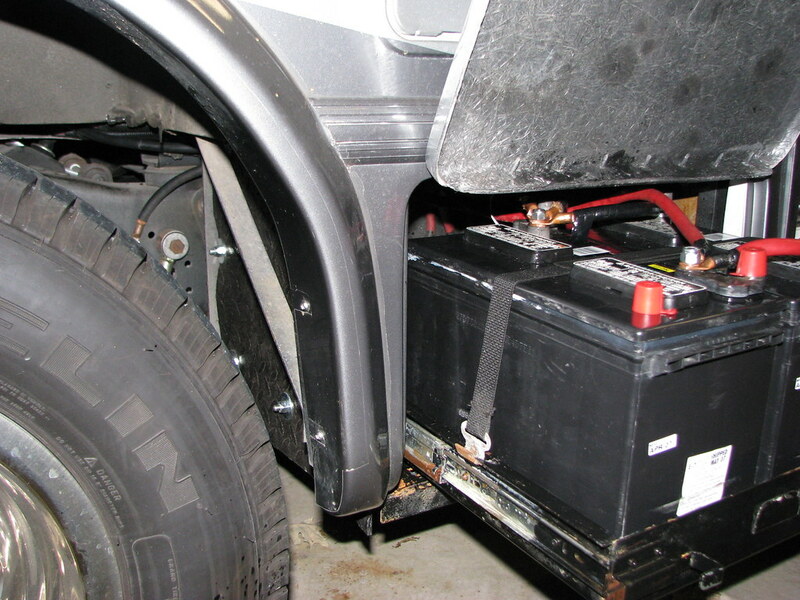 The RV stays planted on the road in a hard turn, with the brakes able to do their job well. This package also eliminates any need for stabilizer jacks when parked. 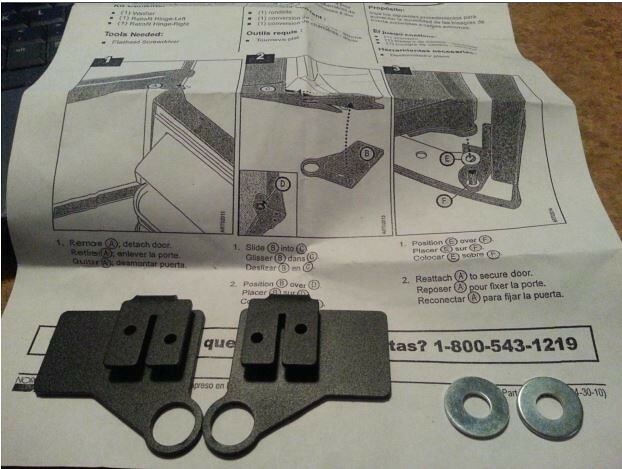 If you are mechanically inclined, you can install some of this yourself and save big money. 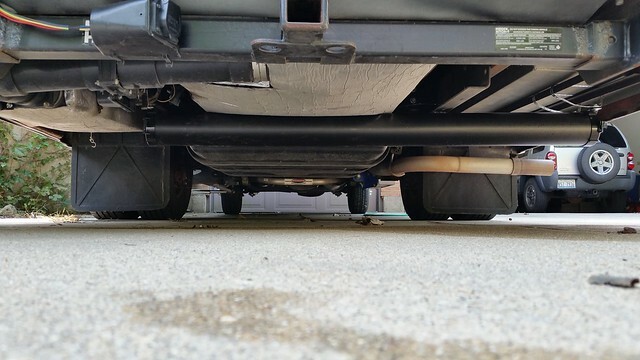 I bought Roadmaster sway bars, but I have since learned that another company Helwig, makes a much lower cost product that is also easier to install. The landscape timbers are simply being stored under the RV. Just ignore them. 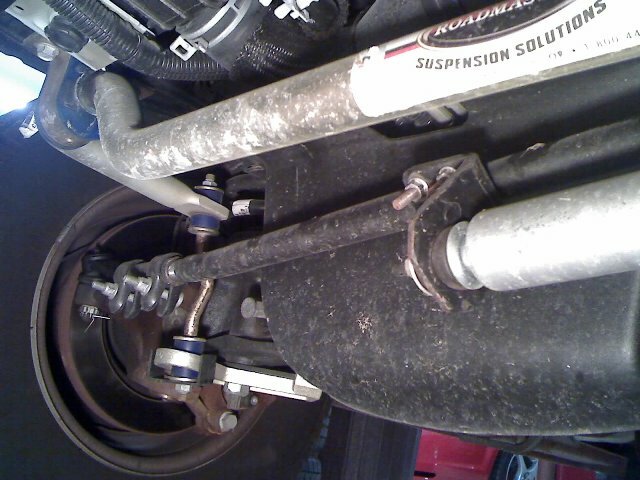 - Replaced the stock Ford shocks with Koni-RV adjustable shocks set to the stiffest setting. Since 2007, Koni now offers their FSD line of shocks for the E350/E450 which provide a soft ride under normal driving conditions, and kick into heavy-duty-action when conditions call for it. But be warned, the price for FSDs will "Shock" you. 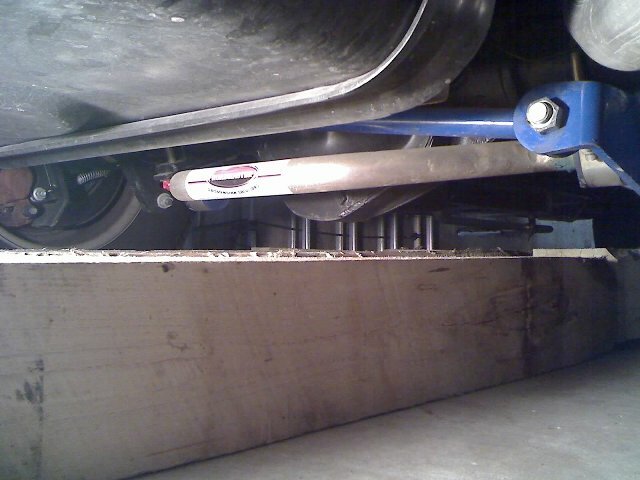 - Got A Wheel Alignment Done The shop had to use off-set bushings to set the camber correctly. 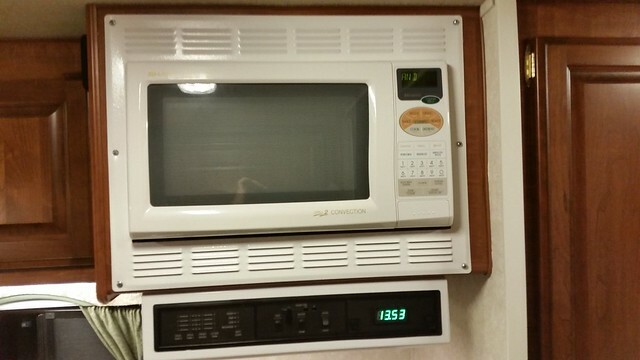 I thought this sounded crazy, but since have learned this is common with motor homes. 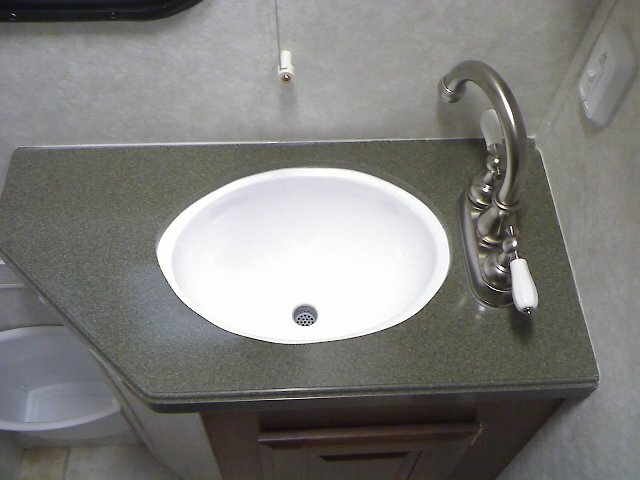 When you need the sink clear, simply swivel the faucet aside like a kitchen faucet. The water falls closer to the middle of the bowl providing nice room for your hands under the running water. Fits perfectly flush. No more lost items down the drain. Called a 1 inch drain basket, sold in all home improvement and hardware stores. It simply drops in. Costs around a dollar. Works great, very strong, folds up very thin. 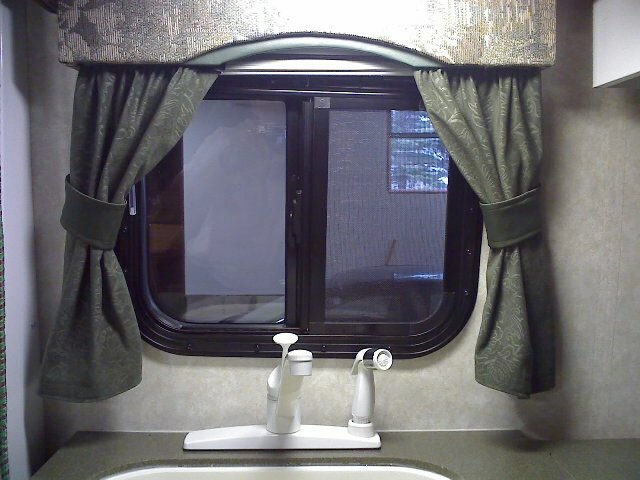 The original curtains were a lighter green. Her new curtains & throw-pillows match the green appoints perfectly. 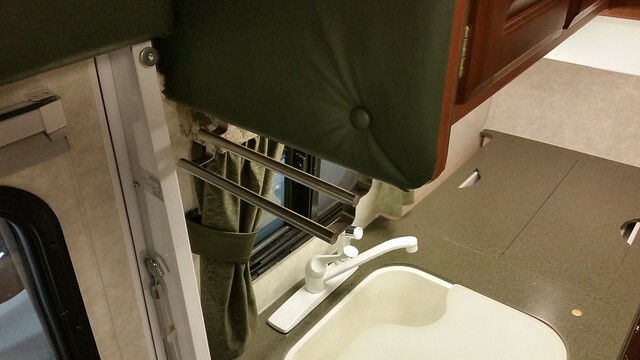 Our rig had no sink window curtains so Irene made a set for it too. 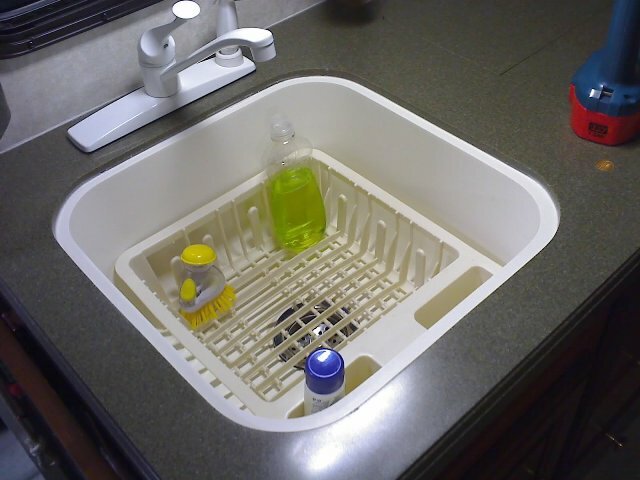 14) Self-Storing Dish Rack, Fit's Perfectly! We later found something better for our particular needs, scroll lower. 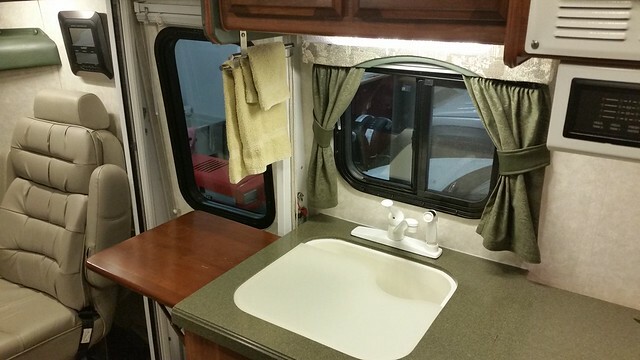 The picture shows only one towel in each, but we fold-n-roll and stand up all needed towels to fit during trips. The upper for me, the lower for my wife Irene. Sold in places like Walmart, Meijer, and Costco, but not all the time. It may be considered a seasonal item. 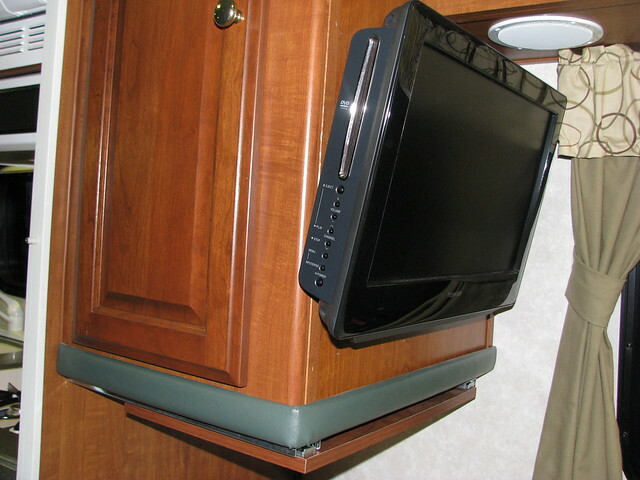 The TV overhangs the cabinet on the isle side, but is flush with the cabinet door. It does not interfere much when getting in and out of bed. Well worth it to us. Widescreen DVD movies are enjoyed in bed. This TV uses much less inverted power than the main TV with sound system. No concern of draining the batteries when watching TV in bed. We bought our two TVs years ago. The LED TVs sold today use so much less power, tempting me to replace ours. Used ones are sold cheap on eBay. I paid $70 including shipping. Fairly easy to swap radios. If you are going to do it, first remove your old radio so you can compare connectors while internet shopping. 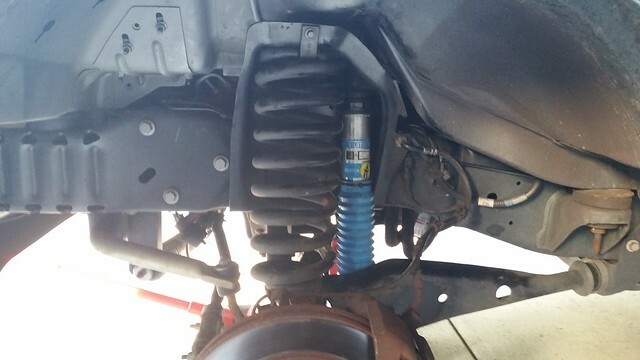 There are a few different connector designs that look similar and you'll need the one that matches your Ford chassis. Cost was just over $400 including the 2 arm rests and adjustable lumbar support. Replaces the original barrel chair in minutes by reusing the pedestal. Much more comfortable and safe. The switch is water proof, bought on the internet. 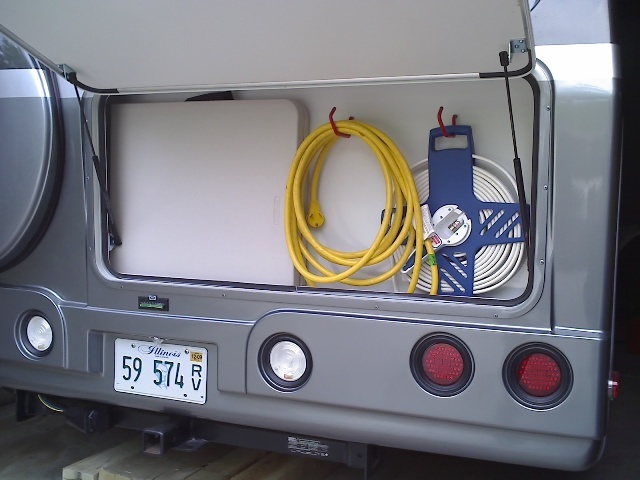 The back-up lights are ideal when hooking up in the dark. Easy to glance at and I don't hit my head on the monitor anymore. 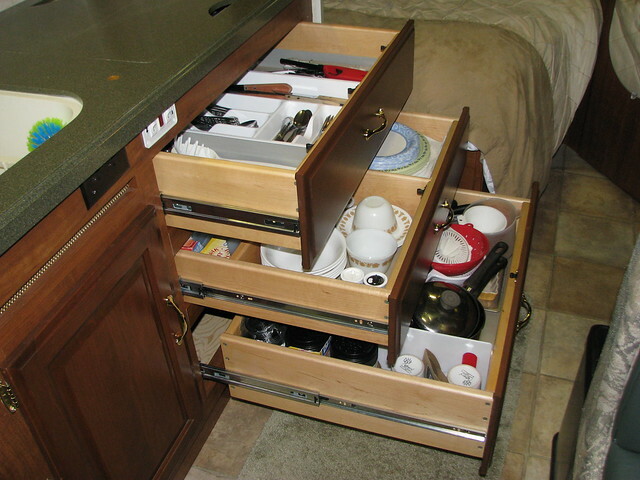 This increased our drawer storage by over 85%, nearly doubling it. CLICK HERE for all the details. 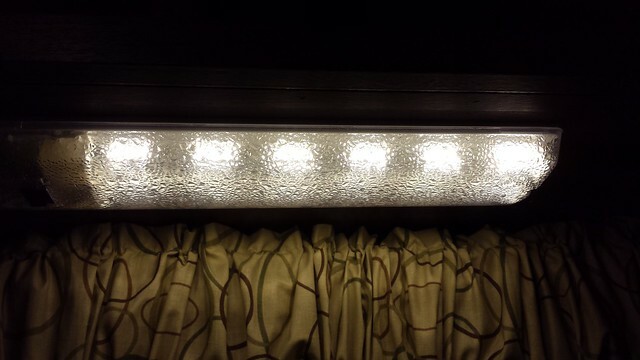 Converted all florescent light fixtures to warm white LEDs, and added an LED mood/night light to each, controlled by a 3-way switch. 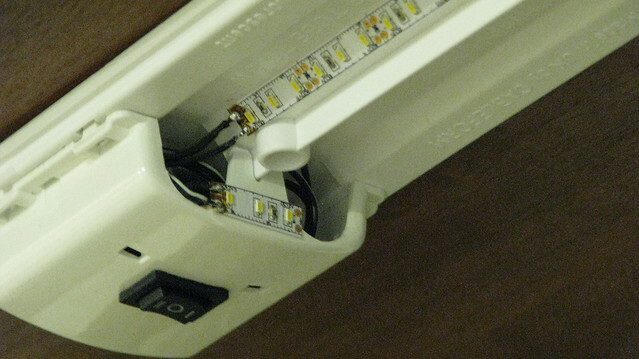 Note the 3-LED nightlight circuit on the side. When all nightlights are on, they offer very nice cozy atmosphere throughout the cabin. 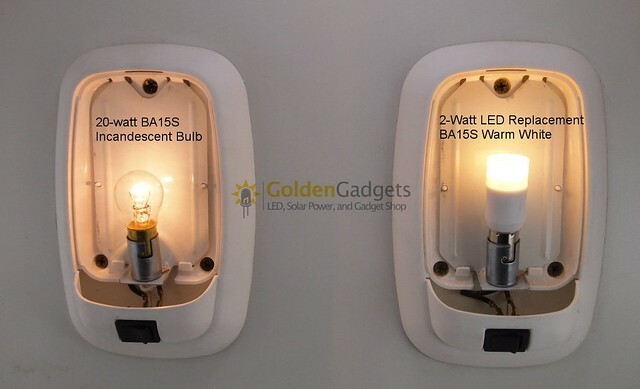 Each nightlight is less than 1/3 of one watt. 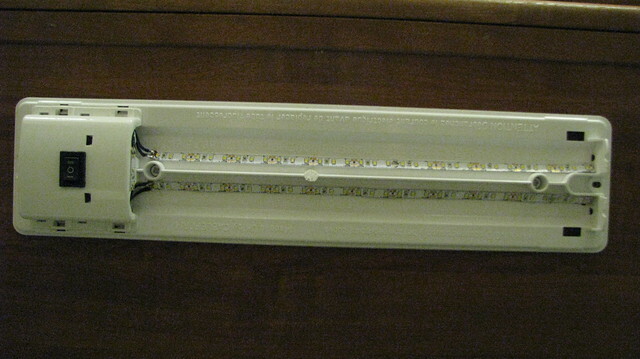 The pair of long LED strips generated too much light so I disabled every other circuit to achieve the proper amount of light which also reduced power consumption to just 3.33 watts per fixture, 1/3 that of the original florescent fixtures. The closet, shower, outdoor storage, porch, and Sanicon lights all got sealed & frosted LED bulbs that use one tenth the energy. 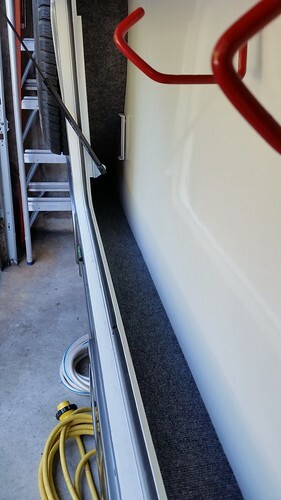 The fridge door lower hinge can break on very rough roads when heavy items are stored in the door shelves. These reinforcements resolve any such concern. 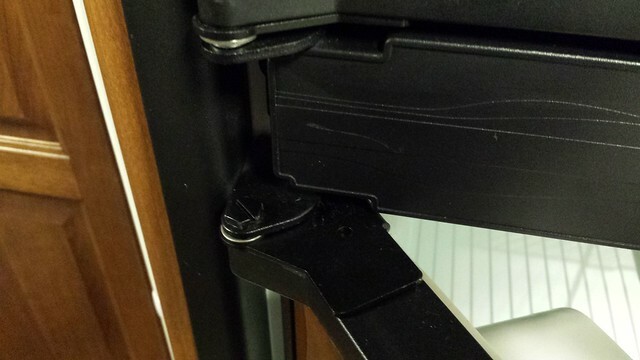 As shown, I put one on every hinge. Relocates all charging away from the gear shift lever area for safer driving, provides easy access for the passenger, cleans power cords off our cup holders. Power is received from the high-power cigarette lighter outlet. 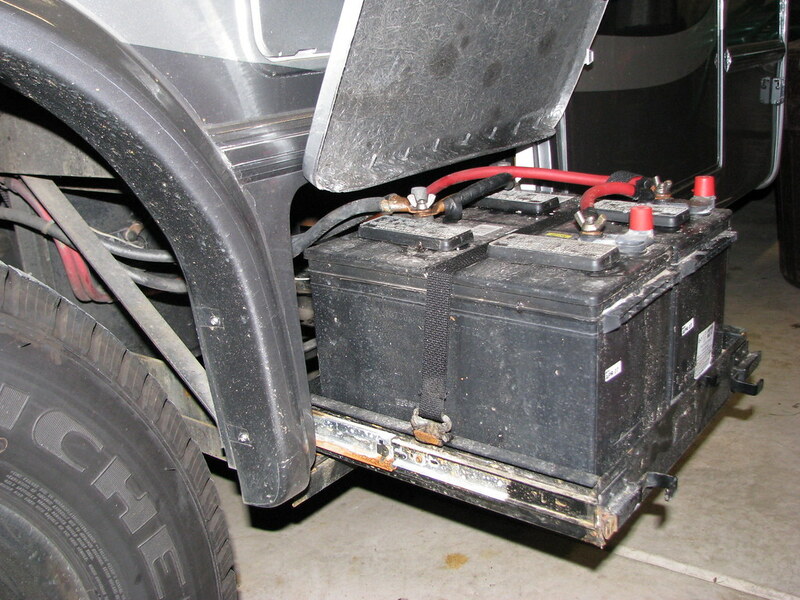 The short vertical dark gray wire seen under the radio, supplies power to the outlets. Not seen is a hidden in-line connector to easily disconnect the center console, required to remove the engine shroud. Increased energy capacity & battery performance. Sacrificed the battery tray to fit, but no need for the tray with sealed batteries. CLICK HERE to read the details. 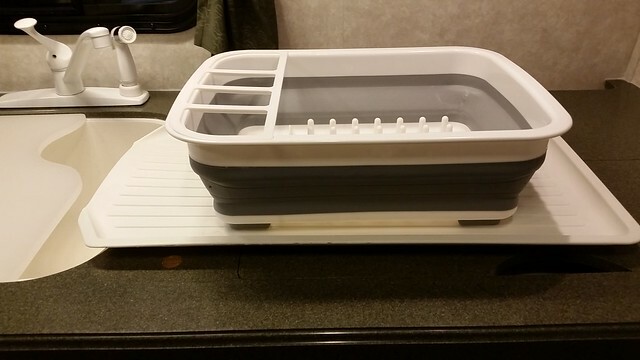 The collapsible dish rack & tray store easily under the rear dinette bench. 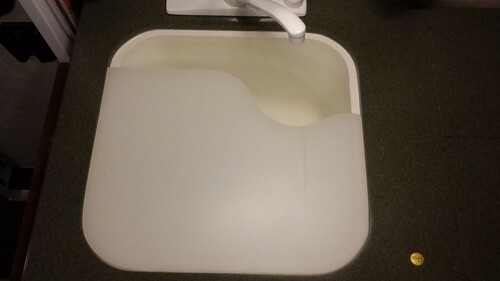 The gap in the cutting board allows water to drip into the sink. 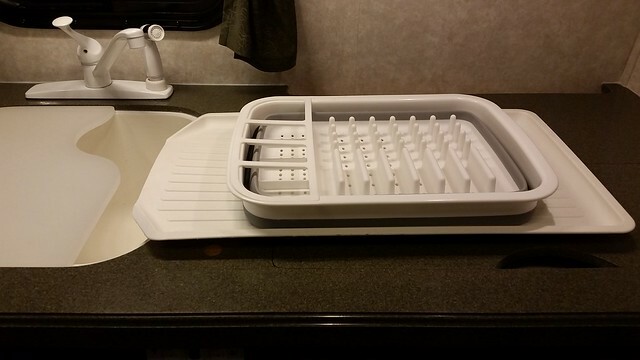 Actually I bought 2 collapsible dish racks for larger wash loads. Stacked up they take up so little space. I ordered this one from somewhere, but forgot from whom. I specified a particular length to consider a Rhino Hose system. This modification worked out perfectly. This rack is out of the way, yet very convenient. 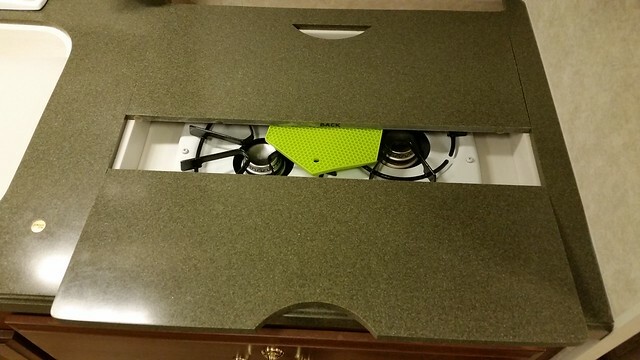 Placed a thick silicone pot holder over the grates prior to placing the Corian covers. Also added rubber pads in between the covers for a snug fit. If you look real close you can see the clear-colored rubber pads. Also wrote "BACK" and "FRONT" on the edge of the covers to place them for best fit. If your rig likes to bounce up and down in the front, READ THIS. I am SO impressed! Those cabinets look great. 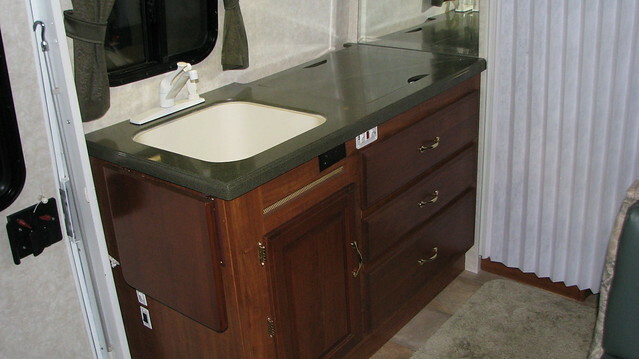 It seems like you guys really spend a lot of time in your RV and putting in the extra effort and time to do them so they look perfect is definitely better than getting them in there quickly and putting in extra time being displeased with them every time you see them. 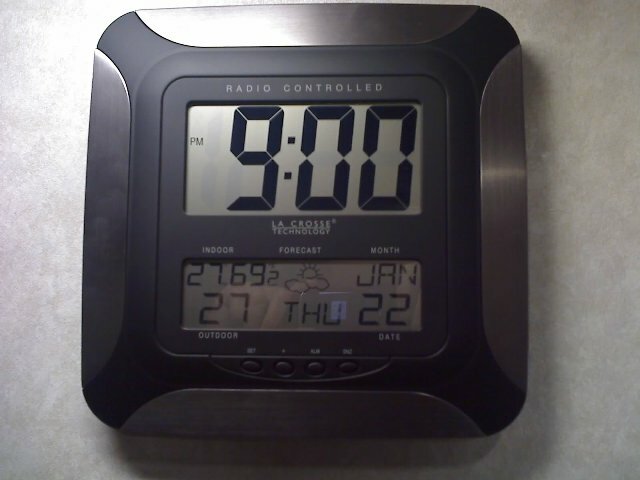 And the clock/thermometer is just plain cool. Those are great improvements. 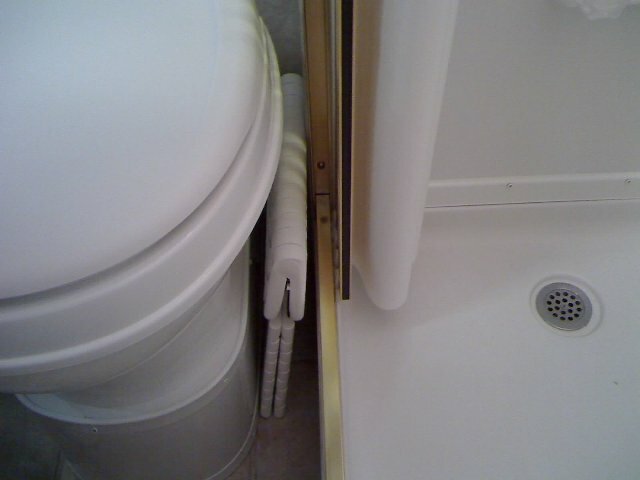 Please send me more info on the Entry Door limiter, Window shade string reinforcements, water pressure tank and thow in the front cabinet idea. 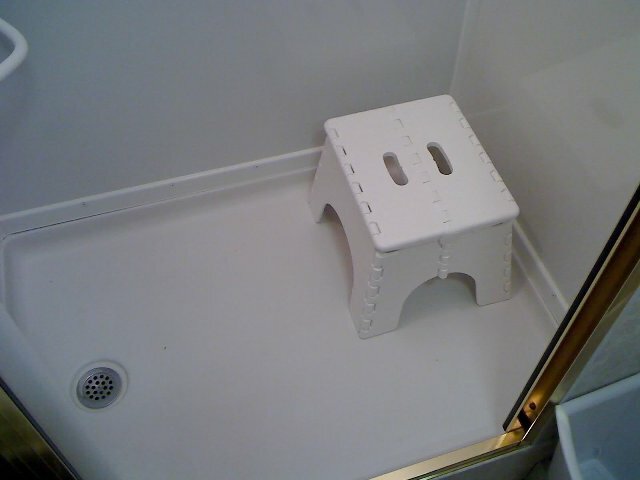 We have already moved the little stool into the bath room. When the weather breaks I'll show you how we stopped the door from swinging shut when the wind blows. My hat is definitely off to the Missus for those curtains. They really are lovely! I'm interested in replacing my TV with a larger one, as well. Can you describe how you remove the existing one? I think I probably have the same one you had. Does the TV slip upward out of its rack. Or is it necessary to remove panels in order to get to the mount behind? We bought our PC without a TV. I was able to reach behind the back wall, and bolted the TV in from behind. I reached behind through the side cabinets. I did trim a little wood from inside a side cabinet to make a larger pass-through to get my arm in back there. The fans are mounted to circulate air from behind the TV to behind the back wall. They are placed lower, with a conveniently located switch that is lower yet, reached easily from under the TV. 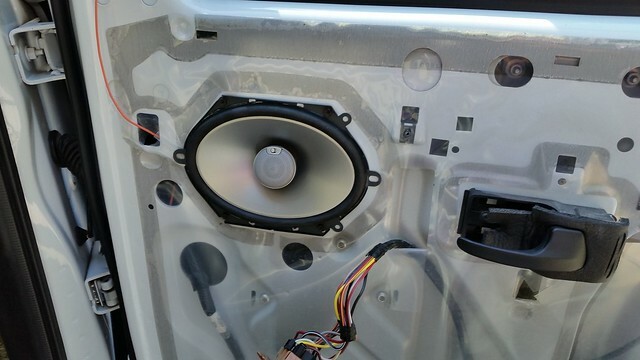 They are wired through a potentiometer to adjust the fan speed to reduce fan noise. It works perfect. 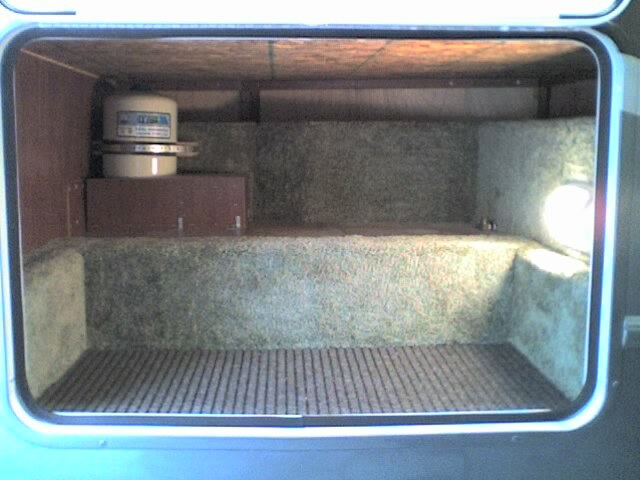 With the air space on both sides of the back wall and additional air being added from under the TV, there is enough air volume to cool it down nicely. I probably over-engineered the whole thing, but I feel better. One thing for sure. If we forget to turn on the fans, the TV does feel much warmer up top. Better safe than sorry. George, you could definitely call Phoenix 574.266.2020 and ask them. 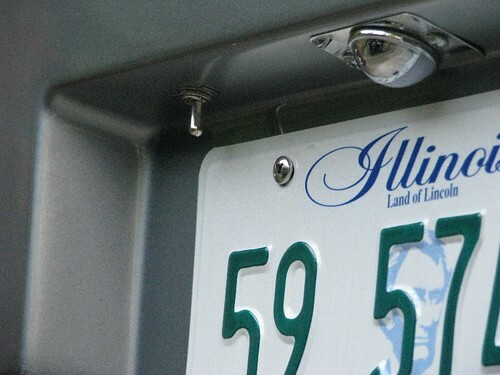 They would know for sure how it's mounted and how to best remove it. Thanks for sharing all of your enhancements. . .great job. 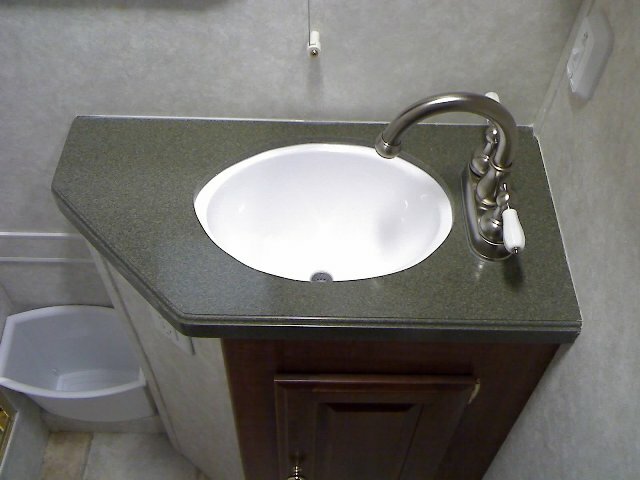 I especially like the idea of the faucet for the bathroom; we'll implement that idea. 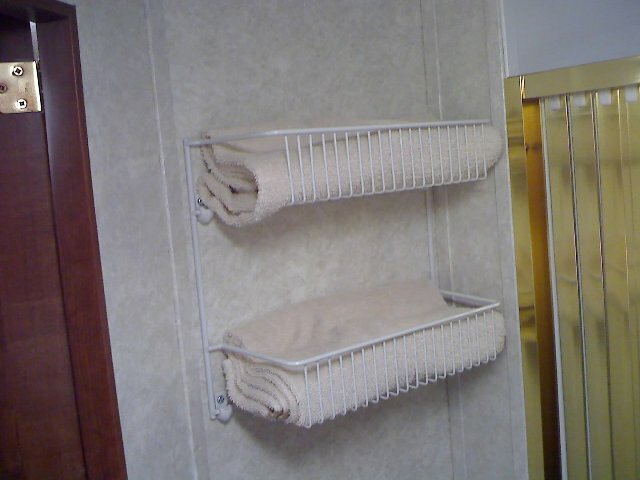 How did you fasten the towel rack to the bathroom wall? How would you fasten to an outside wall? I believe the finished wall board is the same, both inside and outside. I predrilled holes and used simple wood screws. When drilling holes, be sure they are the proper size. Too big, and the screws strip. Too small can be bad too. With this wall board, if you force a wood screw into a hole too small, you can damage the wallboard. The area around the screw will crumble. Pick a drill size to match the inside diameter of the threads on the screws. The wall board is only 1/8" thick which is not thick at all. But don't be concerned. 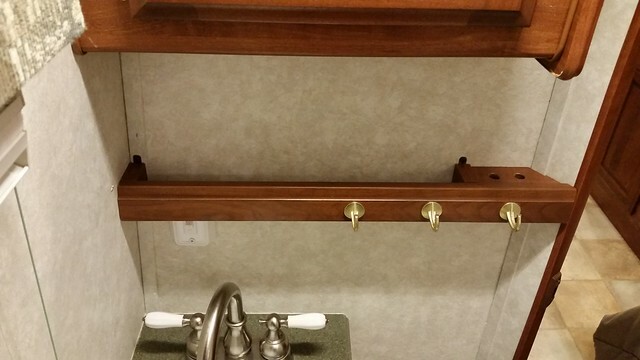 If done right, there is a lot of strength to mount things like towel bars and racks without concern of it pulling off the wall. Of coarse everything has it's limits too. Shade string tensioners are noted for pulling screws right out from the wall when bumped real hard. These modifications look great. You are correct. Taking your time to do it right does pay off in the end. Would you please send me the various details for all of your modifications? I'd like to do the water pump mod first. I too would like for the pump to not cycle as much. Now that our camping season is over, I can't think of anything more my 2350 could use except for one thing.....a propane tank shield. I looked at it briefly, and it appears there is no simple implementation. Over the winter, I will give it a closer look. It might be a project never done. Anyone here add a propane tank shield to protect it from the dual tires behind it? Ron. Could you give us purchase info on the hose and reel you use in the rear compartment ? I bought that "flat white hose on the blue reel" at a Wal-Mart we parked at over-night. I don't recall the cost, but I did recall it was clearence priced. It stores thinly, taking little space. I wouldn't recommend it as a primary hose because it is a bit of a hassle to work it in and out from the reel all the time. I have a standard white RV hose for that. The one in the reel comes out when the other isn't long enough. Come to think of it, I should have bought two of them. 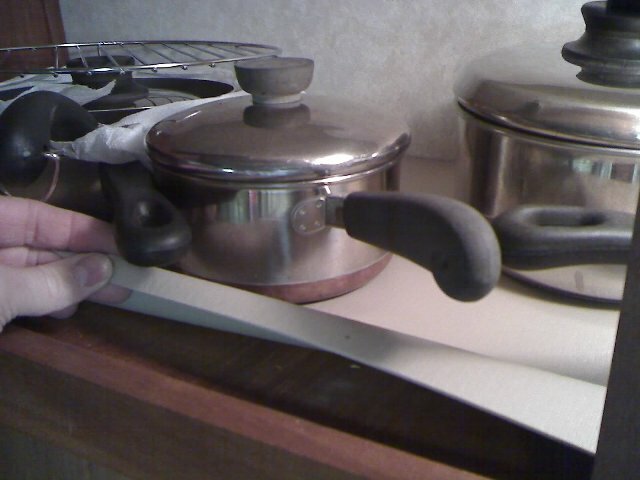 Keep one in the reel and one loose for every day use. I think the flat hose would store better without the reel than a standard hose.